Despite their stereotypically status as "top predators", Mosasaurs as an overall family were incredibly scattered throughout the Cretaceous food chain. Some of the larger more impressive species certainly were at the top of the food web, but the majority of Mosasaurs tended to not be the largest predators in their ecosystem. With this diversity in ecological roles the question is what did Mosasaurs eat? 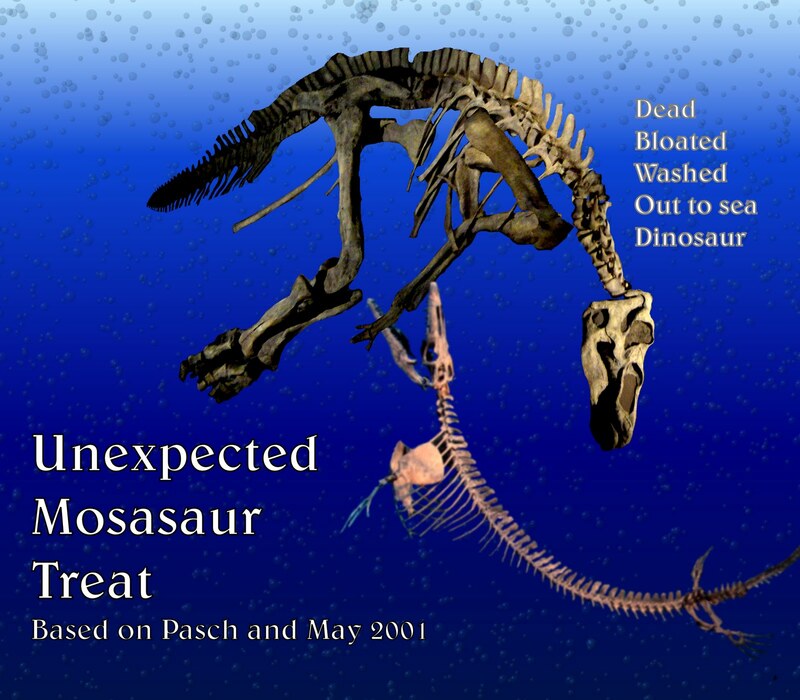 In his 2004 paper on a confirmed instance of a Tylosaur eating a Plesiosaur, Michael Everhart provides a very useful summary of all known evidence of Mosasaur feeding. This chart is a simplification that condenses many species together based solely on their size. That having been said the opinions (versus the peer reviewed papers) of many Mosasaur workers tend to be in line with my guide (which is actually why I constructed it this way :P). For the hard evidence versus the conjecture, please read on. We have been lucky to find many fossil specimens of Mosasaur so complete they preserve stomach contents. Below are the prey animals listed with the Mosasaurs they have been found inside, as stated in Everhart 2004 (with supplementary sources noted by * that can be found in the sources section at the bottom of the post). So we can see fish are a staple for all size classes of Mosasaur. Given the diversity of fish known from Cretaceous oceans this makes sense. It is probably a safe assumption that most Mosasaurs big and small probably ate fish for the majority of their diet. The only question is how big and/or how many? The larger the Mosasaur the more varied its diet could be. This makes sense from a size point of view. If you are larger than everything else, you can more easily chase down, overpower, and of course eat them. Of all mosasurs Tylosaurus was clearly the least fussy eater (at least as far as preserved evidence goes). Of all the completely confirmed prey on this list, only turtles are absent from their (confirmed) diet. However it is safe to assume most larger Mosasaurs had a similar diet, and basically would eat anything small enough for them to safely swallow. Due to their jaw anatomy, a toothed palate that acted like a backup jaw, and their teeth structure it appears quite clear Mosasaurs had to generally swallow prey whole. They probably were unable to tear or take apart freshly caught prey, and so anything they captured they had to ingest all at once. Meaning the prey needed to be small enough not to choke them. There is evidence Mosasaurs could rip off parts of decayed prey (such as the Dinosaur discussed below). However this makes sense as flesh gets softer as it decomposes. This is important to remember when considering the marine reptiles larger mosasaurs ate. While they certainly were large prey, they were by no means the largest species of marine reptiles coexisting with mosasaurs, and in fact appear to be juvenile animals of these smaller species. There is evidence of inter species combat between Mosasaurs (see other post), but this was not predation, and animals killed in these battles were certainly not eaten by the winner (probably due to the size constraint of food size). An obvious question is whether mosasaurs were predators or scavengers. There is no obvious or clear answer. In all likelihood like all modern carnivores, mosasaurs would scavenge when the opportunity arose, and catch prey only if it was the most energy efficient way to meet their own food requirements. With the diversity of mosasaur species there was likely a vast array of lifestyles. While the temptation is to assume that larger mosasaurs were active predators, they could have (much like the large sharks they coexisted with) been highly effective scavengers able to scare or chase away other predators from their kills. At the same point they could very well have been mega predators and hunted anything they wished (they could safely swallow!). The reality is probably somewhere in the middle. Based on Pasch and May 2001. There is a tantalizing find from Alaska that alerts us to real cases in which larger Mosasaurs feed on Dinosaurs. This being the sunken carcass of a young Hadrosaur whose bones were covered in bite marks matching those of a large mosasaur (and not matching any other examined predator, including sharks and predatory fish whose teeth were found at the site). (Sadly in a sense), this was clearly a case of scavenging by the Mosasaur, as the Hadrosaur showed many signs of having died close to (or on) the shore, and post death bloating and floating out to sea. Based on the tooth marks it appears likely the Mosasaur was the reason the duckbill sank, as a series of ribs were ripped out of position, and this would have ruptured the stomach allowing the built up bloat gases to escape. The teeth marks clearly show the Mosasaur was tearing at the corpse. This was probably made possible by the softening of the tissue in decomposition, and allowed the mosasaur to tear meat from the Hadrosaur. That said this is another example of evidence mosasaurs were not equipped to dismember or consume prey matching their size. The tooth marks are most common and pronounced on sections of the skeleton that would have been covered in less meat, such at the lower extremities and ribs. Had the Mosasaur been able to rip through the tougher and thicker sections of meat we'd expect teeth marks all over the body. Instead we only get the marks on parts of the skeleton easy for it to get at. Also if it was capable of regularly dismembering large carcasses we'd expect more bones to be torn off the body. Instead the only bones successful removed were those ribs, and they do not show extreme signs of damage. Proving even a large mosasaur was incapable of doing significant damage to a decomposing body (that alone a fresh sturdy kill). Of course Dinosaurs were not a staple food for mosasaurs, and they no doubt represent a very uncommon to rare "treat" for a lucky marine reptile. Though we continue to find individual Dinosaurs who washed out to sea. So reconstructing this scene is not unreasonable. While I say conflicting evidence, there is a great deal of hard evidence at least some Ammonites were eaten by Mosasaurs. The questions are how many, and just how common a prey were the shelled squid for Mosasaurs? Traditionally Mosasaurs have been depicted and portrayed as commonly preying on Ammonites. This animation clip from the 1990 PBS documentary DINOSAURS being a typical example (though this convention is over a hundred years old). There is some controversy as to just how common this feeding was by Mosasaurs. Traditionally ANY hole found on an ammonite shell was attributed to mosasaur attacks. However the team of Kase, Johnston, Seilacher and Boyce conducted experiments with a robotic set of mosasaur jaws on Nautilus shells, and found the majority of the time the shell was pulverized. They concluded that the actions of less destructive boring limpets were the cause of most holes. Despite these robot/limpet findings, there have been ammonites found with holes that were most likely caused by a Mosasaur bite of some kind. In these cases the holes are in a triangular formation (matching the triangular snout of a mosasaur), had the right number of holes for approximate tooth counts of known mosasaur species, AND had holes on both sides of the shell clearly demonstrating a bite by both an upper and lower jaw. So while clearly ammonites occasionally fell victim to predation by Mosasaurs, for the moment we are not sure just how common this behaviour was, and if it was limited to specific species or common across all size classes of Mosasaur. I included ammonites in all size classes on my diagram as I have not been able to properly access any of the supplementary papers listed above. I will revise this all once I do. 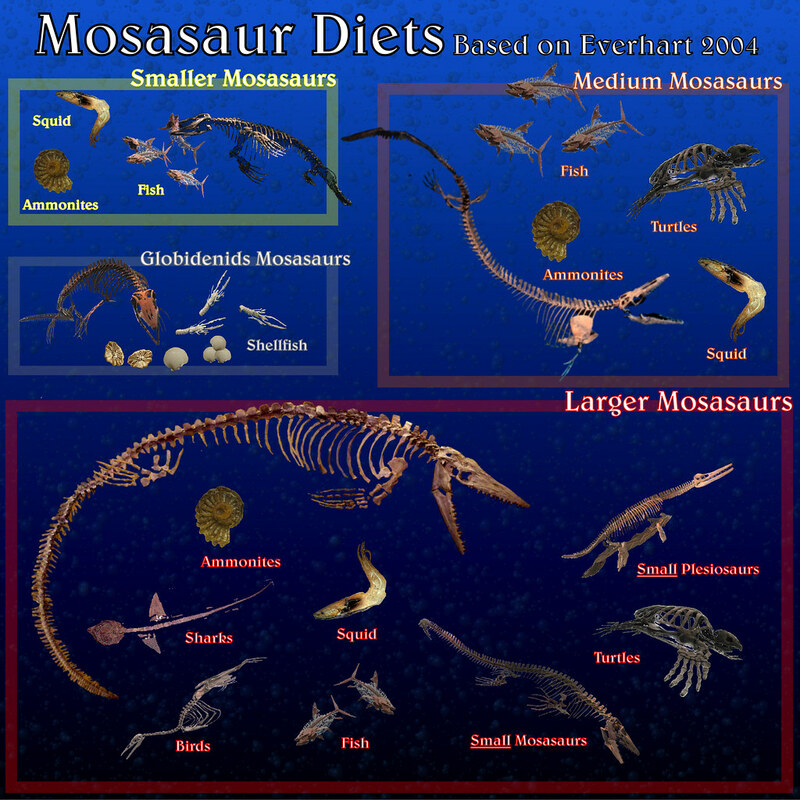 Given all we know about Mosasaur diets so far (quite a lot compared to many other prehistoric mega-predators!) you have a great deal of leeway in your reconstructions. Probably the only limitation you have is the mosasaurs general inability to tear apart prey, and thus they were limited to what they could safely swallow. You are free to explore active predation, passive scavenging, or any variant inbetween! *Martin, J. E. and J. E. Fox. 2004. Molluscs in the stomach contents of Globidens, a shell crushing mosasaur, from the Late Cretaceous Pierre Shale, Big Bend area of the Missouri River, central South Dakota. Geological Society of America, 2004 Rocky Mountain and Cordilleran Regions Joint Meeting, Abstracts with Programs, 36(4):80. Pasch, A. D., K. C. May. 2001. Taphonomy and paleoenvironment of hadrosaur (Dinosauria) from the Matanuska Formation (Turonian) in South-Central Alaska. In: Mesozioc Vertebrate Life. Ed.s Tanke, D. H., Carpenter, K., Skrepnick, M. W. Indiana University Press. Pages 219-236.